Social media has drowned us in superlatives. Amazing, OMG, fantastic, awesome, etc etc. 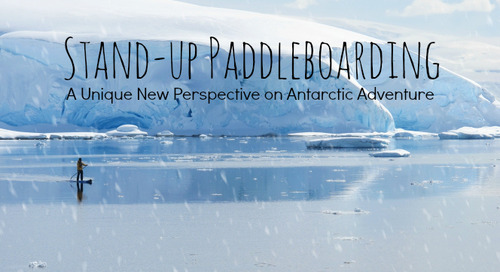 So, how can I possibly recount a recent adventure in the Arctic without recourse to the same? Perhaps I should focus on the professionalism of our expedition team, the guys and gals from Quark Expeditions. These are the folks who variously hunt out the best wildlife viewing opportunities, lead hikes in polar bear territory, and manage our safety whilst boarding Zodiac inflatable boats from the mother ship on lively seas or on shore landings. Or, should I concentrate on the natural phenomena that such a trip reveals? From the four thousand Beluga whales crowding the mouth of the Churchill River just as we were setting off on our voyage (initially I had thought the bay just had a lot of white-capped waves on it), to the ethereal swathe of the Northern Lights all around us further north in Hudson Bay. Then there was the awe of one million guillemot nesting on Akpatok Island, and their fledglings who leap hundreds of metres from their nests, only for some to miss the sea and be consumed by the polar bear who spend part of their summer here. There were random sightings of a lone polar bear though the fog on Monumental Island, a humpback whale who swam nonchalantly past our ship as were leaving Disko Bay in western Greenland, and the discovery of herds of musk ox on Diana Island, just off northern Quebec. I also saw a bay full of comb jellyfish, displaying iridescent blues and greens, accompanied by millions of pteropods, small mollusc seemingly ‘flying’ through the crystal clear waters. Maybe I should recount the time we spent with remote communities up here in the Far North. 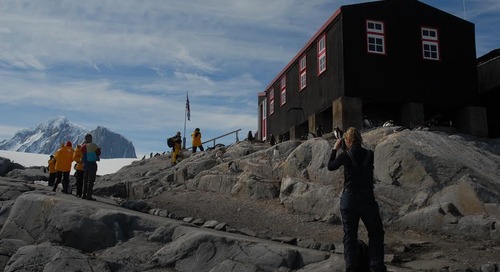 There was an enthusiastic welcome from the people of Kimminut on Baffin Island, the younger ones expectant of a successful rematch with the ship’s band of very international, albeit amateur footballers. Also memorable were the freshly caught Greenlandic prawn offered to us by the people of Sisimiut, alongside dried minke whale and raw beluga skin, the latter very much an acquired taste! And then there’s the physical aspect of the landscapes we pass through. The brightly coloured moss and lichen of the tundra, interspersed with patches of Arctic cottongrass, berries, and small but colourful flowers and fungi in abundance. The dark and foreboding dolorite intrusions into glistening white banks of quartzite on Marble Island, or the endless mountains of western Greenland hiding the icecap, home to 9% of all the world’s ice mass. Let’s not forget to mention the ice. The iceberg we happened upon as we entered the Hudson Strait, estimated to be one square mile in size, and most likely the remnants of a major calving event from the distant Petermann Glacier in north west Greenland a couple of years earlier. The many bergs in Disko Bay had chaotic shapes, their thunderous birth witnessed first hand when we hiked to the side of the Eqip Sermia glacier. Nothing competes with the truly enormous icebergs stranded at the head of the UNESCO World Heritage site of the Ilulissat Icefjord, all awaiting their release into the sea with the next Spring tide. Of course, one needs some respite from all this excitement. Guided by the expedition lecture team, we were simultaneously educated and entertained on subjects as diverse as glaciology, the history of the discovery of the Arctic regions, modern day geopolitics, and the natural history of the region. And with luxury cabins, somewhere to rest our heads after enjoying fine dining and excellent service in the restaurant and bar on the ship. There were a few celebrations too - a party to mark the end of our passage across Canadian Arctic waters and entry into the Davis Strait. There was also the inevitable ‘Neptune’ ceremony as we crossed the Arctic Circle, the ‘Polar Plunge’ for those who fancied a dip in Arctic waters, and a final dinner and trip slideshow to mark the end of our passage. We had enough sightings in two weeks to give flashbacks for months ahead as we all return to reality; enough experiences to give happy memories for a lifetime.